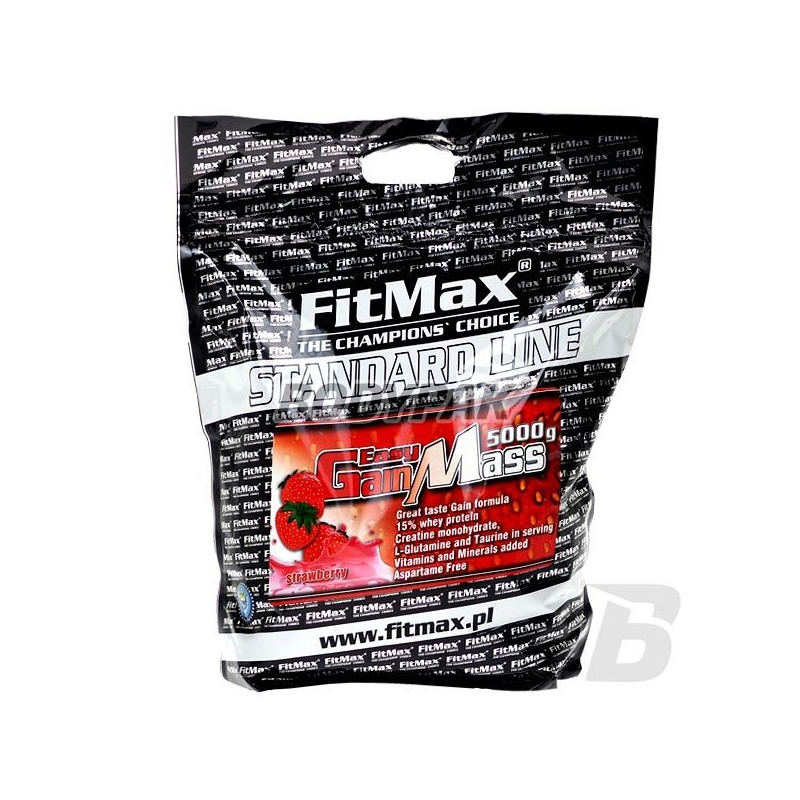 FitMax® Easy Gain Mass - a carbohydrate-protein supplement with a high content of creatine, glutamine and taurine. 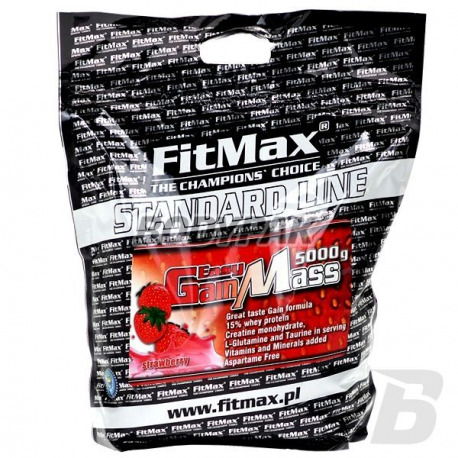 FitMax® Easy Gain Mass - This product is designed especially for power sportsmen, speed-strength, and endurance. Perfected composition of the product in conjunction with a properly prepared diet allows fast weight gain as well as the restoration of glycogen after strenuous exercise. The mixture of complex carbohydrates - contains 100% clean, long-chain polymers of glucose. It provides us with the supply of high-quality "fuel" for a long time, helping to rebuild glycogen stores; providing facilities for energy processes and changes taking place in our body. A blend of simple carbohydrates - thanks to the rapid absorption provides the body with an immediate energy boost. Ultra filtrated whey protein concentrate - very easily digestible; absorbed from the gastrointestinal tract in only a few minutes, it has a broad amino acid profile and high biological value. Ultra and microfiltered whey protein isolate - the absorption time of several minutes, characterized by the highest biological value; ideal in the diets of mass in order to achieve adequate muscle mass allows immediate delivery of the appropriate amino acid composition of our body. He participates in the transport and rebuilding of ATP - ATP serves as an energy carrier in our body, without it the course of most reactions, ranging from simple synthesis of the muscle contraction, would be impossible. Creatine for its ability to bind phosphate groups (then transformed into phosphocreatine) is involved in the transport and rebuilding of ATP. It inhibits catabolism - thanks to their ability buffering helps to maintain proper muscle pH. It is very important that the majority of the enzymes responsible for the breakdown of muscle tissue can only operate in a very acidic environment. L-glutamine - the most commonly occurring in the body amino, performing a number of very important functions: alters the filling process, glycogen by increasing the rate of its synthesis in the liver, as well as by direct conversion to glucose positive effect on the rate of protein synthesis and reduces their disintegration and strengthens the immune system and prevents diseases that could hinder training plays an important role in the process of transamination (allows the synthesis of new amino acids); is converted to glutamic acid constituting a source of energy for the nerve tissue and perform a number of other important physiological functions. Micronized L-Taurine - helps regulate blood sugar, has anti-catabolic (reduces protein breakdown), increases the nitrogen concentration in the body and helps to reduce cholesterol levels. Very important is the fact that L-taurine stimulates the pancreas to secrete insulin. It does, however, other than glucose, thus reducing the risk of insulin resistance that leads to diabetes. This allows us to enjoy all the benefits of insulin - a strong anabolic - without worrying about our health.